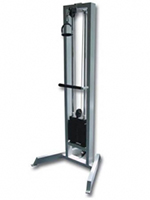 The cable machine is a piece of equipment used in weight training or functional training. A wide variety of exercises can be performed using the apparatus. Stand in front of the cable machine holding the rope with your arms held up at shoulder height. Step back into a lunge and pull the cable towards your chest. Keep your elbows at the same height as your shoulders. Stand back up to the starting position with your arms back out in front of your body and repeat.